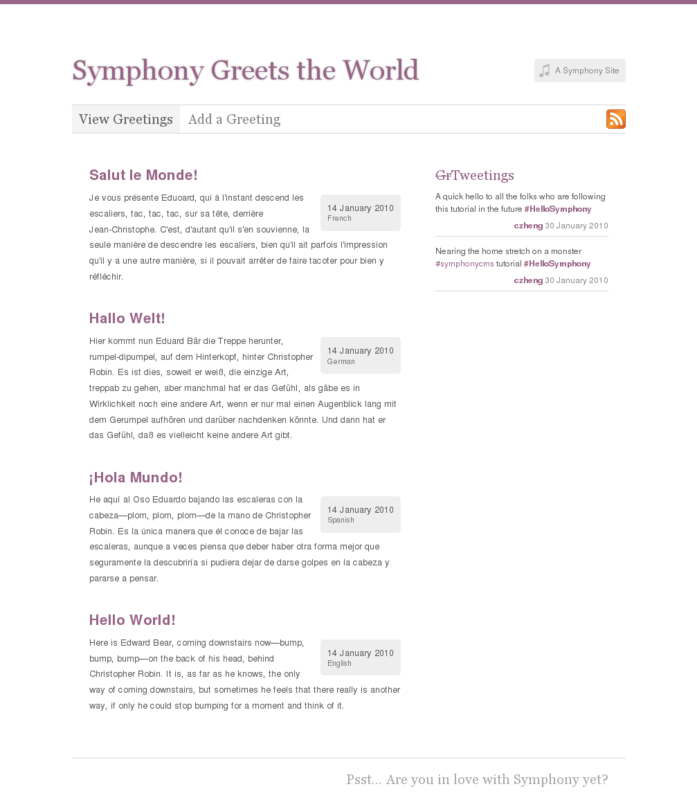 “Say Hello to Symphony” – Tutorials – Learn – Symphony. In this "Hello World" follow-up, we build out a full-featured site, with front-end submission, an RSS feed, Twitter integration, and more. In the Hello World tutorial, you got a peek at the most basic of Symphony workflows. Here, we'll expand on that, introducing you to the system more thoroughly and demonstrating some of its most useful features. We'll be building on top of the simple site we created in the previous tutorial, so if you haven't completed that yet, take a few minutes to do that now. Little by little, we'll enhance that site to show you some of the key features and workflows you'll need to understand in order to use Symphony for your own projects. By the time we're done, you'll have a feature-packed site—with intelligent and dynamic templating, error handling, front-end submission, RSS output, Twitter integration, and more.